The freezing waters underneath Antarctic ice shelves and the underside of the ice itself are of great interest to scientists… but who wants to go down there? Leave it to the robots. They won’t complain! And indeed, a pair of autonomous subs have been nosing around the ice for a full year now, producing data unlike any other expedition ever has. The mission began way back in 2017, with a grant from the late Paul Allen. With climate change affecting sea ice around the world, precise measurements and study of these frozen climes is more important than ever. And fortunately, robotic exploration technology had reached a point where long-term missions under and around ice shelves were possible. The risks seem to have paid off, as an update on the project shows. The modified craft have traveled hundreds of miles during a year straight of autonomous operation. It’s not easy to stick around for a long time on the Antarctic coast for a lot of reasons. But leaving robots behind to work while you go relax elsewhere for a month or two is definitely doable. They navigate in the dark by monitoring their position with regard to a pair of underwater acoustic beacons fixed in place by cables. The blue dots are floats that go along with the natural currents to travel long distances on little or no power. Both are equipped with sensors to monitor the shape of the ice above, the temperature of the water, and other interesting data points. 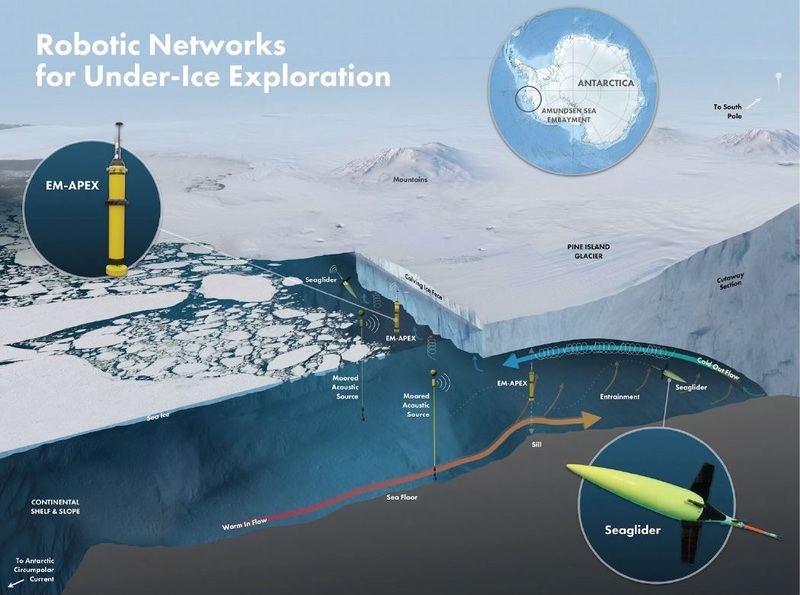 It isn’t the first robotic expedition under the ice shelves by a long shot, but it’s definitely the longest term and potentially the most fruitful. The Seagliders are smaller, lighter, and better equipped for long-term missions. One went 87 miles in a single trip! The mission continues, and two of the three initial Seagliders are still operational and ready to continue their work.